loving. living. small. 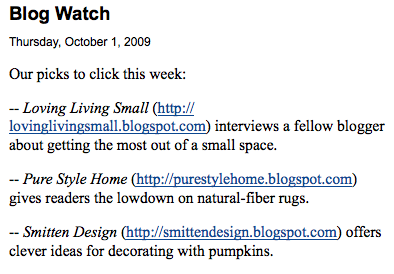 | live small with style: THANK YOU, WASHINGTON POST! Wow!! Just saw a mention of loving. living. small. and the new a small chat interview series as a blog watch pick in the Washington Post's Home section! I am honored to be highlighted here. 4 Responses to "THANK YOU, WASHINGTON POST!" Yippee! i just found your site and i ♥ it very much. So glad for you and your wonderful mentions!!! I make a small mention of you on my blog. Continue having fun and making people happy through your blog! *Thank you* Happy to have you lovely new readers via the Washington Post, my hometown paper! Just found you through the Washing Post mention! Terrific blog and tips!! !